Established in 1999, the Live Art Development Agency has both responded to, and impacted upon, the increasingly influential nature of Live Art practices in the UK and internationally by developing an extensive portfolio of specialized resources, opportunities, projects and publishing activities; and by working strategically, in partnership, and in consultation with practitioners and organisations in the cultural sector. The Agency particularly supports the most challenging artists, practices and ideas of contemporary culture, including emerging artists, and artists from culturally diverse backgrounds. The Agency develops specialized resources, opportunities, projects and publishing activities for artists, audiences, students, researchers, teachers, writers, producers and promoters in the UK and internationally. The Agency works on curatorial projects, programming partnerships, and dialogues and debates to develop new contexts, discourses, and audiences for Live Art. As well as curatorial events and programming partnerships, the Agency develops stranded activities such as Restock, Rethink, Reflect (2006-14), an ongoing series of public programmes, professional development activities, and archival and publishing initiatives for and about artists who are engaging with issues of diversity and identity politics in radical ways. Live Art Unpacked extends the Agency’s work into a diversity of international contexts, and furthers collaborations with organisations and artists, by offering a range of programming packages including artist’s films drawn from the Agency Documentation Bank, illustrated talks, and artists’ development activities. Unpacked activities have taken place In Spain, Finland, India, Czech Republic, Brazil and Germany. The Agency provides artistic development activities for artists, support for Higher Education, and professional development initiatives for the Live Art infrastructure. The Agency offers a range of artistic development schemes in collaboration with practitioners and organisations that aim to respond to, and support, the needs and expectations of artists as they change throughout their career: from those of recent graduates and emerging artists (Talking Shop, EEC, Fresh, SPILL) to those of artists who have developed a substantial body of work over many years (One To One Individual Artist Bursaries and Legacy). The Agency is committed to supporting artists to self determine their own development and pursue bespoke artist-led strategies that are appropriate for their practice. The annual DIY scheme specifically invites proposals from artists to conceive and run innovative and idiosyncratic artistic development programmes for other artists and is run in collaboration with partner organisations throughout the UK. To stimulate new processes and approaches, the Agency collaborates on workshops with leading UK and international practitioners within the context of its broader programmes. The Agency works in partnership with Queen Mary, University of London, and the Spill Festival of Performance on platforms and other specialized programmes to provide creative and instrumental opportunities for graduates and emerging artists at a critical stage in the development of a professional practices. The Agency hosts short, research based, Study Room residencies by international and UK practitioners. The Agency works to support Live Art in Higher Education by contributing to research, study, and teaching at individual and institutional levels. The Agency is partners with University of Roehampton and Goldsmiths, University of London on Performance Matters, a creative research project bringing together artists, curators and academics to investigate the challenges that contemporary performance presents to ideas of cultural value. The Agency works to support the development of Live Art in the UK through the coordination of the Live Art UK network, and by working in partnership and dialogue with organizations and policy makers in the UK and internationally. Live Art UK is a national network of 22 venues, promoters and facilitators who collectively represent a range of practices and are concerned with all aspects of the development and promotion of the Live Art sector. Live Art Unpacked supports UK and international organisations to develop Live Art programmes and artists initiatives by offering a range of bespoke packages including artist’s films drawn from the Agency Documentation Bank, illustrated talks and artists’ workshops. The Agency provides access to a wealth of specialised research facilities; information and advice; online films, documents and programming packages; and the distribution of films, publications and materials. The Agency’s Study Room is a free, open access research facility housing one of the largest publicly accessible collections of Live Art related films and publications in the world. The Study Room is used by artists, students, curators, academics and other arts professionals. At the heart of Unbound are independent, artist led books, DVDs and editions. Unbound provides a mechanism to draw a critical relationship between the texts published by major publishing houses and those materials that are self published by artists and arts organisations. The Agency, in collaboration with the British Library, maintains the Live Art Collection, a growing archival resource of Live Art related websites. The Agency’s You Tube Directors Channel LiveArtOnline contains a collection of films and resources posted to You Tube by artists. The Agency publishes and co-publishes books, DVDs and Artist’s Editions. See the Agency’s publications and co-publications here. To mark the tenth anniversary of DIY, 2013 is a bumper year with 23 projects taking place across the UK between July and November produced in collaboration with 21 national partner organizations. 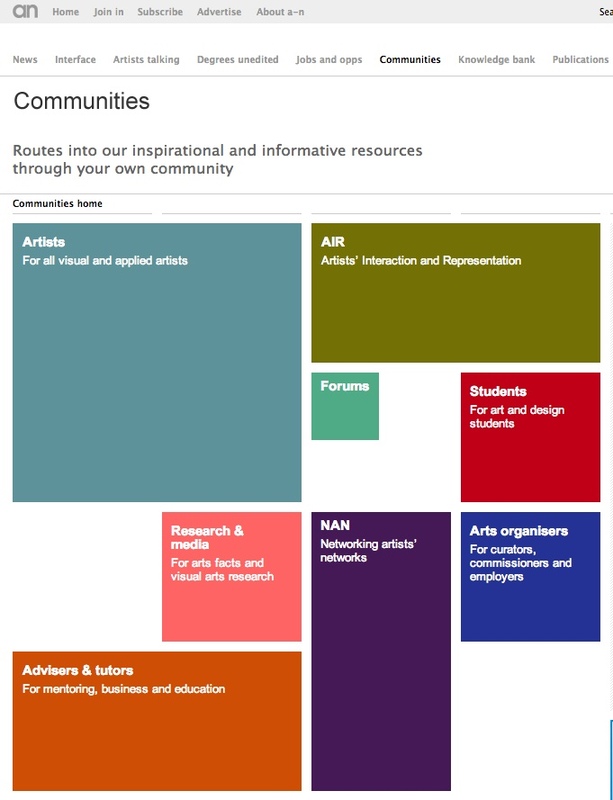 www.a-n.co.uk offers fast routes into an information-rich resource that’s relevant to all engaged in the visual arts. Our in-depth features and content are designed to represent the multiple voices and wide range of activities and industry insights within contemporary visual arts. Provides inquisitive and responsive news punctuated with comment, analysis and longer features, and pointers to more indepth items and material from a-n’s rich archive. It covers the broad spectrum of contemporary visual arts, including events, cultural policy and research, artist-led and independent activity. News editor Chris Sharratt draws on intelligence from our users and is keen to develop and expand our regular writers – a-n welcomes input from a wide range of contributors and the views expressed are not necessarily those of the editor or publisher. AIR – the voice of visual and applied artists – identifies and explores issues that impact on artists’ practice, and campaigns for artistic, legislative and economic measures that enhance artists’ working lives and their professional status. AIR promotes the central role of the artist within a diverse and sustainable cultural landscape. Artists talking exposes contemporary artists’ practice with artists’ blogs, interviews and articles. Plus Artists’ storiesand Image bank. Artists discussing their practice and experiences through personal blogs about the projects they’re working on, as they happen, wherever they happen. Starting a project? Why not share your experiences by writing a blog about it? Editorially commissioned features on significant and emerging artists, includes artists’ firsthand experiences alongside interview-based profiles. Over 8000 images from over 3000 UK and international artists whose work has been editorially featured in any of a-n’s publications or web sites since 2000. Knowledge bank reveals the varied and complex worlds in which artists operate. Read tours, profiles and archive articles that offer valuable information, insights and strategies on contemporary art practice from a range of expert voices. Discover more about making a living, finding time and space, improving profile and promotion and maintaining professional practice. An open space for new critical writing about contemporary art exhibitions, performance, artists’ publications and public art. Listing of exhibitions and events around the UK and beyond – a-n subscribers post your own listings for FREE! Access to reviews listed by venue or publisher. Index of the writers who have contributed reviews to a-n Magazine and Reviews unedited since November 2000. An invaluable archive of a-n’s inspiring publications and critical research, exposing the ‘why, what and how’ of artist’s practice, with an emphasis on artist-led activity and diversity of practice across the UK. Packed with thorough analyses and decisive debate exposing the diversity and complexity of artists’ practice now and in the future. Current and archive a-n publications including a-n Collections, Research papers and Degree Shows Guide. a-n’s publications are edited by a host of remote and office based staff from across the art world. This quarter Spotlight brings together a selection of a-n partner organisations to profile Open House and Open Studio events taking place across the UK. Searchable, comprehensive route to salaried and fee-paid work, and other opportunities for visual and applied artists and arts organisers including awards, commissions, opens…. Find out more about organisations in the Employer index. The Estonian Contemporary Art Development Center (ECADC) was founded in January 2012. Through ongoing projects like the Visiting Curators Program, Tallinn Tuesdays, and International Gallery Internships, the organization is focused on fostering international exposure for Estonian artists as well as developing the gallery scene in Estonia. Nomadic in structure, our team members are located in Tallinn and New York. ECADC is funded through grants from the European Regional Development Fund. 3. Extending, allowing space, providing directories.